You could build your next application completely from scratch. Many of us were used to doing so early in our careers and could reasonably manage the list of requires and includes for our sites to function. Software is much more complex today and when you’re mixing external code with your own classes, tracking dependencies is no longer a trivial task. 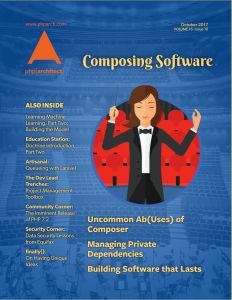 This month, we have articles on using Composer effectively to track your software dependencies.